Despite my role in Chicago’s early success, I was, in some ways, a victim of our ‘faceless’ status. Individually, the singer/songwriters within the band rarely received the recognition they perhaps deserved. My first solo album (Skinny Boy), was released during Chicago’s mid-70s peak popularity, featured as a top pick in Billboard, and still, languished. Although I continued writing for the band, I didn’t resume my solo projects until the late 80’s. A conference with Chicago’s manager, Howard Kaufman, suggested clearly that going forward, on the singles, the band would be featuring neither my songs, nor my voice. I knew I had to, now, concentrate on solo projects, to find fulfillment and expression. I relocated back to New York City in 1991, and soon found new energy in my songwriting, for a new solo album (Life is Good in My Neighborhood) and for the band’s Stone of Sisyphus. I had found my voice, but the 90’s found the band’s recording activities in decline. A little background: I was born and raised in Brooklyn, NYC. That city resonates within, always. My parents listened to the music of their youth: jazz and musicals. To keep me out of trouble, my mother enrolled me into a very good choir (Grace Episcopal, Brooklyn Heights). This enveloped my pre-teen and early teen world. I was excited by the beginnings of Rock. Even after moving to Chicago (1960) I found Jazz, Rock, R&B and Blues on the radio and on my mind. On a lark, I formed with a 4-piece band, playing a Wurlitzer Electric Piano. I heard Ray Charles, studied him, along with Miles, and Jobim. It made me want to do what they did. (I’m still trying). Less than two years as a music-major at Roosevelt University in Chicago opened my ears to Classical works, and I realized it was composing that would always be my interest. As a founding member of the legendary ‘Rock with Horns’ band, I have lived the changes that have occurred in the band and the world of music. The band, which began as an experiment in 1967, has alternately broken new musical ground, set trends, fallen into disfavor, only to rebound and ultimately find a permanent and influential place in the mainstream of Pop/ Rock. In 2014, the band’s debut album, Chicago Transit Authority was entered into the Grammy© Hall of Fame. It’s no coincidence that 7 of the 12 songs on the album were my first compositions. Make no mistake. 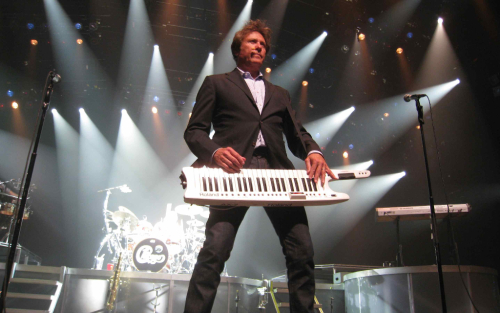 I understand there would be no Robert Lamm without Chicago. I write this now, having to do with work. I am a loner and very comfortable with it. I will not retire, and that’s ok, I like bringing home the bacon. The reality of being in this band for my entire working life is that they are and have been, close co-workers, thrown together by necessity, and shared purpose. A reality that is, at best, middlebrow, but without deep context or vocabulary, and so we have no language in common. Because of what we do, (perform and record music) there has been mutual enjoyment, shared experiences, (satisfaction or disappointment) amusement, and acquisition of a bit of maturity and something like wisdom. Increasingly, the thrust of my fulfillment is derived from the writing, arranging and producing of versions of my newer songs. I enjoyed earning positive reviews for ‘Chicago Now’. I have loved working on solo recordings; they have brought interaction with a wide range of other musicians, an experience, which I treasure. I have learned to trust my instincts, in the studio, having worked and formed close friendships with Phil Ramone, John Van Eps, and Hank Linderman and others.